We feature scribes in the Indo had to recall how we spent our childhood summers in various parts of the country. I was bigging it up for my homies in southwest Tipp/east Limerick, to be specific. I was eight or nine years old when I first saw the sea. But don't cry for me, Ballybunion. Growing up in landlocked south Tipperary, kids who knew how to swim were the glamorous exception rather than the rule. Ironically, the village of Emly where I was raised had teetered on the edge of a small lake in historic times. A local farmer drained and reclaimed the marshy areas in the land- hungry 1800s. By the time I was mucking about in my size three red wellies, the neat patchwork of fields behind our house was intersected only by shallow streams. Despite this, or perhaps because of it, we were obsessed with water. The first job on day one of the summer holidays was to build a dam across an ankle-deep ditch we euphemistically referred to as The River. (Every feature in the landscape of childhood summers was the definitive. The wall behind our tiny housing estate was The Bog Wall; the low-lying field prone to winter flooding was The Marsh; and a piece of wasteland where we played shop in a deserted tumbledown cottage was The Jungle. Tipperary town nine miles away was, well, Town). The purpose of the dam was to create a shin-level pool where we would trap helpless brickeens (or tiddlers) in jam jars. Sometimes we set them free straight away. Sometimes we brought them home to show our parents, before abandoning them to their fate on a sun-flooded windowsill with all the casual cruelty of childhood. A week later we'd discover the forgotten jam jar, stinking with stagnant green river water and three brickeens floating belly-up on the surface. We would be briefly devastated before drifting away to watch some kid make a go-cart out of two planks of wood, four mismatched bockety wheels and a piece of twine for steerage. Going to the seaside for your holidays was mind-boggling. When the girl two doors down from my house came back after a week in Lahinch or some such beachy paradise, the rest of us crowded around to inspect the criss-cross tanlines stencilled on her back by her swimsuit straps. We could not have been more impressed had Coco Chanel, pioneer of bronzing, landed in our midst. Summertime was all about that touch of the exotic. School terms were dictated by routine -- school, homework, shopping in the L&N in Town on Saturdays, trip to the grandparents on Sundays. In the holidays there were only a few appointments to be met. The triumphant return of local hurling hero Nicky English in early September. The daily saunters to Byrne's shop for a cola-flavoured Mr Freeze. The dash to the post office every second Thursday to pick up my elder sister's copy of Smash Hits. It was from this bible of pop music that we pored over the lyrics of songs that will forever be my soundtrack of summer. Madonna's 'La Isla Bonita', Wham's 'Club Tropicana', Eddie Grant's 'Electric Avenue'. Anglo-Bajan reggae fit perfectly to the relaxed rhythm of 1980s rural Ireland. I finally got to see the sea through the intercession of that great bit of visiting glamorama, The English Cousins. The accents! The trendy outfits from English high-street stores we had never heard of! The general air of worldiness of people who had eaten in Pizza Hut! My father's brother, his wife and two children arrived one summer, bundling us all into a rental car made to seat five. The car wound slowly over the border into Limerick, crossed the Shannon -- stopping at the Two-Mile Inn for pints of Harp and Dwan's red lemonade -- sped through Ennis and out to the cliff-edge of Clare. Never, ever will I forget the tang of seaweed in my nostrils as we approached Kilkee and that first glorious glimpse of the water as we crested the final hill into the town. It lashed rain but I went into the water anyway and was nearly knocked unconscious by a wave. I was the happiest concussed kid in Munster. It remains the case that Ireland's most amazing tourist attractions are largely ignored by the people living next to them. We had the Glen of Aherlow on our doorstep, a lushly forested valley carved deep into the foothills of the Galtee Mountains. English friends of my parents on a visit from London decided they and their accents wanted to explore it. They managed to find a trout farm, a discovery to us all. We had to listen to the unfortunate fish flopping about in the boot of the Mini all the way home. I remember my mother grimly gutting the trout at the sink, no doubt wondering why her visitors couldn't be happy with a few chops for dinner. It was the same with the continentals who swung through the village in their unwieldy camper vans on their way to glowering Galtymore. Mountain hiking was not something locals did. How was sweating unnecessarily to the top a form of relaxation? Madness. But when I nipped over the border to stay with my grandparents in east Limerick, I was the tourist. 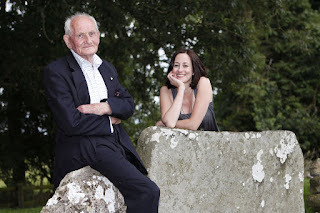 We would cycle our bikes with Grandad O'Regan to Grange Stone Circle outside Bruff, where he would talk about the Neolithic people who had died there 4,000 years earlier as if they built their funny circular huts only yesterday. This was their clock, he would say, pointing out the two proud stones through which the sun would shine in a perfect line every summer solstice. We would nose around an old wedge tomb for the bleached bones of those first farmers, and look out for Carraig Aille, where Grandad's own father had helped sift painstakingly through the soil during the excavations by Professor Sean P O Riordan. "My father would say sitting on a potato sack with a small brush was an easier job than saving the hay," Grandad would laugh. I thought so too: I went on to study archaeology in my first year at UCC. Onto Lough Gur (The Lake, natch) where we clambered up Knockfennell Hill to survey our kingdom and feast on Polo biscuits and bottles of milk. Knockfennell was an easy trot -- it was only climbing the Galtees that was idiocy. Summers smelled exotically of coconut: the dessicated white shards of it in the Polo biccies and the sweet coco-nutty scent from gorse bushes. Afterwards Grandad would grab my sister and I by a hand each and run full tilt down the hill, laughing like a maniac. That man knows no danger, Granny used to tut, but his wildness was intoxicating to us. You think your grandparents can walk on water at that age. And true to form, Grandad rode his bicycle across the surface of the lake when it froze hard in the winter of 1939. He also let us sit in front of him on the lozenge-shaped saddle of his Honda 50, us 'steering' the motorbike. "Jack!" my granny would yell as she spotted our approach towards the cross near the house. "We're for it now," he'd nudge and wink. He's 90 now, and still climbing ditches. The thrill-seeking didn't end there. Oh no. The Pride of Tipperary festival would bring a funfair to town. We had chair-o-planes. We had disco waltzers. We had a stupendous tower with a spiral staircase in the middle. The stair brought you to a doorway at the top from where a slide twisted its way down the outside of the structure. You were plonked down onto a bristly doormat, given a push-off from whatever spotty teen was "in charge" and whizzed to the bottom. Danger? We hardly knew you.